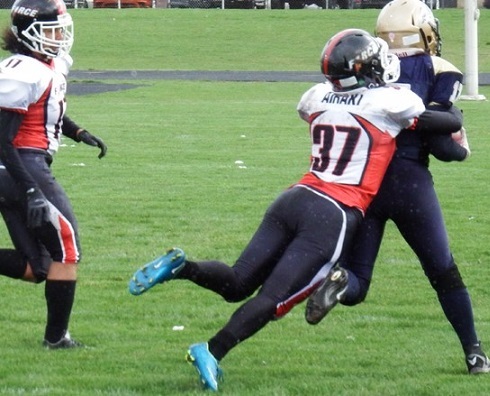 SCHOOLCRAFT MI: The Chicago Force knew they would face challenging playing conditions when their charter bus encountered swirling snow flurries, white outs and severe winds as they neared the field for the opening game against the West Michigan Mayhem. The gusting winds of over 30 mph limited the opportunities for either team’s passing attack. The Force offense dictated the pace by amassing 412 yards and 7 TD’s with their running game as they pounded out a 58-6 win in brutal conditions. Quarterback Rasan Gore led with 165 rushing yards and 3 TD’s. Three first year running backs handled the rest of the carries: Tamika Robinson (150 yards, 3 TD’s), Emma Vanderheyden (53 yards, 1 TD) and Javell Thompson (43 yards). Gore also threw for 79 yards on 6 of 11 attempts. 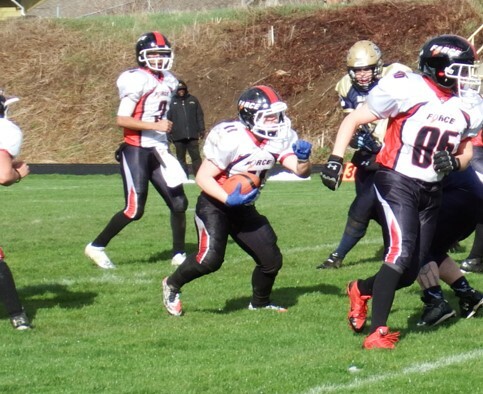 Wide receiver Jamie Fornal led with 69 yards and a TD and first year receiver Alli Alberts moved the chains with a 10 yard reception on a quick slant. 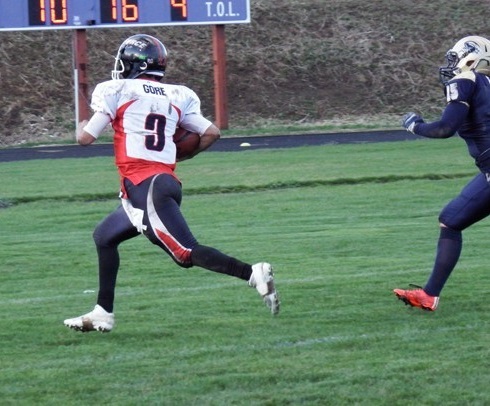 Fornal also had a touchdown on a 54 yard punt return in the 3rd quarter. The Chicago defense limited the Mayhem to just 4 first downs and 70 yards of total offense. Linebacker Kelsey Casey was all over the field, leading the defense with 9 tackles, a pass deflection and a fumble recovery. Tami Engelman and Jill Airaki were active with 5 and 3 tackles respectively. The Force remain on the road traveling to Indianapolis next Saturday April 9th to play the Indy Crash in another divisional match-up. The Crash won their opener as well so the winner will move into first place in the Great Lakes Division. The Force home opener is April 30th at Lane Tech Stadium in Chicago, kickoff is at 5pm.